Bishop Rob Hirschfeld's broke bread with the congregation of Saint Barnabas Church on the evening of Monday, September 10, 2013. The dinner was bountiful with a potluck supper which included many fresh vegetables, harvested from the local gardens of church members. Afterwards, about 30 members were lead by the Bishop in an open discussion about the transition from interim Pastor to a new permanent Minister for our church. The conversation was honest, candid, supportive, and extremely helpful. Participants aired their concerns and opinions. 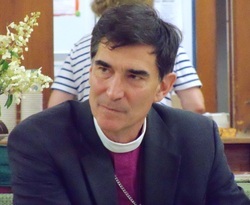 Bishop Rob listened and thoughtfully responded with his vision for the future of the church in Berlin and New Hampshire. It was a wonderful evening! Thank you Bishop Rob for coming. And, thanks to all the members who had the time to join together. It was a wonderful evening!